Death End Re;Quest begins with Shina Ninomiya waking up in a strange world with no recollection of who she is or how she ended up there. Eventually, Shina discovers that she is trapped inside a VMMORPG called 'World Odyssey', a game that she co-developed with a colleague. Not only that but in order to return to the real world, she needs to complete the game with the "True Ending" so that she can log out. Unlike the premise of most games based within a gameworld, Death End Re;Quest's provides a more realistic take and Shina’s quest is further complicated due to World Odyssey being an incomplete game, leaving a world that appears to be glitchy and ridden with bugs. Death End Re;Quest is a new IP from Idea Factory. 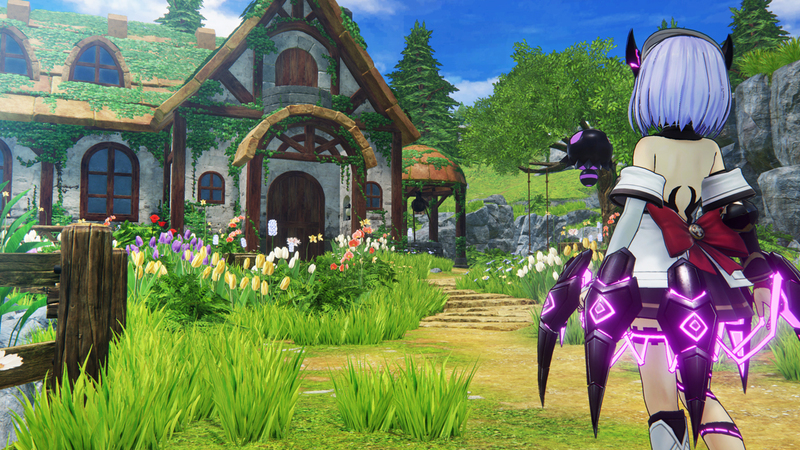 The game is a blend of a traditional RPG and a Visual novel in one package. The gameplay is split between the perspectives of Shina and her colleague Arata. 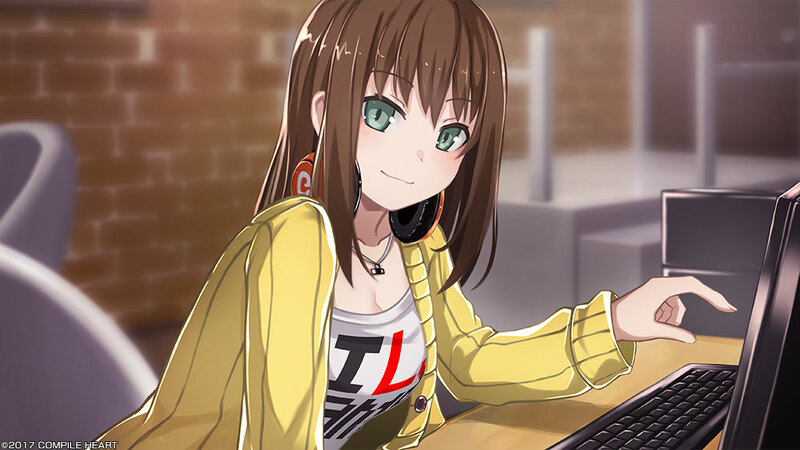 When you are following Shina’s perspective, it will be within the RPG virtual world that they created, with all of the gameplay elements that entails, but whenever a ‘game breaking’ bug is encountered, you will take control of Arata. As Arata is still in the real world, he is able to assist by troubleshooting the bugs blocking Shina’s path and this portion of the game is completed through familiar Visual Novel gameplay mechanics. As stated, Shina’s perspective takes place within the virtual world and follows a familiar RPG gameplay style. Exploring dungeons will feel quite disjointed due to World Odyssey being an incomplete game; there won't be any town interaction and environment will drastically change from one location to another, which often times will make finding the key items to advance the story quite tedious. 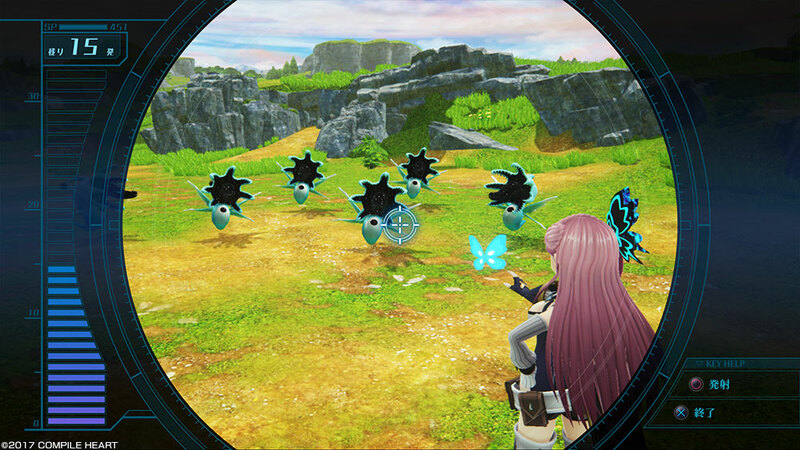 Combat is done in a turn-based system within a 3D combat field, where Shina teams up with various characters from World Odyssey as party members. During fights, each character is allotted three actions per turn and if they land three attacks it will trigger a combo bonus knocking enemies away from them. The more frequently you use skills, a chance of learning new ones may also occur. When one of your characters receives too much damage, they will become a corrupted copy of themselves and the ‘glitches’ caused by the corruption will allow them to transform and inflict more damage on targets through stronger attack skills that become available. The actual area available for battles is relatively small, which will encourage you to use the knockback mechanic and sometimes it might be the only way to win which really limit the strategy you should be using. As the story progress further, Shina will encounter various NPCs that can aid her on her Journey. One of the interesting elements that they have integrated into the game is the ability to unlock character abilities that change the genre of the actual combat system. For example, Arata will eventually be able to ‘install’ a first-person shooting engine into the virtual world which allows Shina and her friends to temporarily fight as if she was in a shooter game or even other genres. When you reach story sequences, the game will switch to a Visual Novel format similar to those encountered in Idea Factory’s popular Neptunia series. However, unlike the Neptunia series, the choices have actual consequences and can change not only the course of the game but the ending as well. Unfortunately, with the inclusion of these choices, there are some paths that will result in an instant game over without any warning. This problem is exacerbated by the fact Death Re;Quest does not have an auto-save function which means encountering one of these dead ends can cause you to lose significant progress if you have not saved recently. Luckily most of the time when these options are in, you can access the Quick Menu, giving you the option to save, but either way, it is highly recommended to save on every time when these occasions occur. The benefits of viewing a bad ending will give you a new piece of equipment from the event viewer. So you will most likely try to view every possible option regardless of their consequences. While the story can be engaging at times, unfortunately, the major bulk of the storyline is spent on the Virtual World which often has the story sequence filled with needless exposition or the story will be interrupted by Shina becoming sidetracked regardless of being in a life or death situation. The segment of the Virtual MMO world is sadly not engaging as Arata's story segment. As Arata deals with many strange paranormal activities that occur in the real world, which gives off a more psychological horror. While Death Re;Quest does not provide an exceptionally lengthy story the games life is extended by the inclusion of numerous different endings and storyline paths which include individual character endings as well. This really helps to provide replayability and gives gamers who want to entirely complete the game plenty of hours to explore all the storylines. As far as new IP’s go, Idea Factory has provided a solid entry and deserve credit for trying something drastically different from their previous works. While Idea Factory succeeded to some degree by introducing a variety of gameplay mechanics, Death Re;Quest is still just a mediocre RPG in the end. 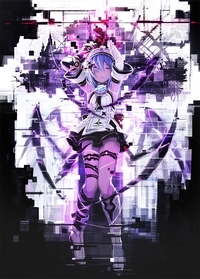 Death End Re;Quest attempts to take a serious tone with the storyline and by doing so it tries very hard to present itself as a horror game, yet this effect is often spoiled by the introduction of many anime tropes which leaves the player confused as to the intended tone of the story itself. Unlike the Neptunia series, where the whole game has the luxury of playing with anime tropes and parodies, Death Re;Quest tries to rely on the merits of Idea Factory's own strength of mixing in Neptunia like gameplay and a more serious Visual Novel story, but sadly I think the game would have worked out much better as a standalone visual novel than a JRPG.